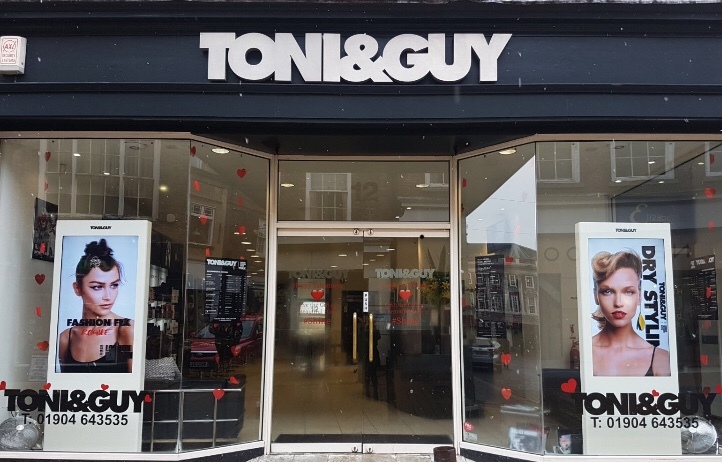 TONI&GUY YORK opened in the town in 1998. York Beauty opened early 2018. We are committed to providing the ultimate salon experience, paying great attention to customer service. Our talented team of stylists and technicians are on hand to give you expert advice on the latest trends and services. Members of our Colour team hold the prestigious Wella master colour expert-their knowledge and expertise are on hand to advise you on the latest colours and techniques. We offer many additional services including Bridal and Occasion hair, the NanoKeratin Smoothing blow-dry and Microlinks/ring Tape extensions. Our wide range of haircare products include label.m, Kerastase, GHD, Wella, Tangle Teezer to keep your hair salon perfect until your next visit. For more information on our services please speak to our friendly reception team who will be happy to help! STRENGTH IN STYLE Strength in Style is now available in this salon, offering people affected by cancer specialist support and advice on hair care. This service includes styling pre, during and post treatment hair, and wig personalisation with the option to purchase synthetic and human hair wigs. Please contact our friendly reception team for more details. Niki was really great. Really listened to what I wanted. I felt she took great time and care while cutting my hair. Thank you so much for taking the time to leave your hair review. I will be sure to pass all these lovely comments on to Niki. we look forward to seeing you again for your next amazing salon experience. From all of us at Toni&Guy York. I booked my appointment over the phone explaining to frankie that I’d had a bad experience at another salon. She was understanding and very helpful. Then when I had my appointment she was lovely. Straight away I knew she knew her stuff and enjoys why she does. She was friendly and professional, she gave me advice and I bought some anti frizz cream. I also booked another appointment with her in 10 weeks time. I have been looking for a hairdresser that I can go back to and trust and I’ve found it in frankie. Thank you much for taking the time to leave such an amazing 5* hair review. We are so please that you have managed to find a salon and a stylist that you can re-gain all trust in. Frankie is a brilliant stylist and amazing at what she does and we are so glad you agree! Matt was great! Listened to what I wanted, asked lots of questions and talked me through everything he did. I’ve been looking for a stylist I can visit when I’m back in the country and this was my first visit to T&G York; I’ll definitely be visiting Matt again. Thank you! Thank you so much for taking your time to leave such a lovely hair review. Matt is a brilliant stylist, we are so glad you agree! We are please that you have found everything you was looking for in a stylist, we look forward to seeing you again soon for your next amazing salon experience. Thank you for taking time to leave this amazing hair review. we look forward to seeing you again soon for your next amazing salon experience. Thank you for taking your time to leave your hair review. We appreciate all feedback given so this will certainly be addressed. We will be sure to pass your lovely comments to the team here at Toni&Guy. Holly is a wonderfully able, sensitive, convivial and delightful stylist. A thoroughly enjoyable experience and an amazingly improved appearance! Thank you for taking your time to leave this amazing 5* hair review. Holly is a brilliant stylist and we are so glad you agree, I will be sure to pass all the lovely comments on to Holly. We look forward to seeing you again soon for your next salon experience. Thank you so much for leaving this lovely hair review. We look forward to seeing you again for your next salon experience. Everyone wants feedback these days and you sometimes have to wonder if it's taken notice of. Lauren has been doing my colour for several years now and she's an excellent colourist, but the time before last, something went a bit wrong so I mentioned it in the feedback. This was acknowledged in a most generous way at the end of my most recent appointment. Thank you so much. I'm also pleased to say that I am very happy with the result, once again. So many thanks again. We appreciate all feed back to help us improve and we are so pleased you saw this in your most recent visit. Thank you so much for leaving your hair review with such lovely comments I will be sure to pass them on to Lauren. We look forward to seeing you again for your next salon experience . Alice always gives a really personal touch to your haircut. She’s got a lovey personality but also offers great advice for haircare and which styles would work well! Thank you for such lovely comments I will be sure to pass them on to Alice. We are so please you enjoyed your salon experience and can't wait to see you for your next one. Holly is always cheerful and always gives a great haircut. Thank you for taking your time to leave this fabulous Hair review. Holly is a brilliant stylist, we are glad you agree. We look forward to seeing you again soon for your next salon experience I will be sure to pass on your comments. My hair looks so good, the colour is just perfect. Thanks to Alison for her advice and professional work. We are please you are happy with your outcome, it did look amazing when completed. I will be sure to pass on your lovely comments. That lass has a funny hairstyle though. My trim work in progress was a worrying experience - turned my hair grey. It turned out OK in the end though. Niki is a Brilliant stylist, we are glad you agree. I will be sure to pass all your comments on to the team. We appreciate all comment and I will be sure to pass your lovely comments on to the team. I have just had my hair cut by Tim visiting from Newcastle. He was lovely and really cared about how I wanted my hair and gave lovely advice. I would pick him everytime if he was in York. Thank you so much for taking the time to leave this hair review. I will be sure to pass all your kind comments on to him. My first time cut with Niki, she really listened to what I wanted and I’m very pleased with the outcome. we will pass on your comments to Niki and the team. Thank you for taking your time to leave us this lovely 5* hair review. I will be sure to pass your kind message onto Frankie and the team.